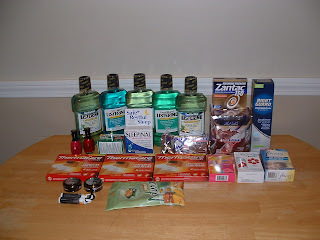 Frugal & Fabulous: CVS - braving the blizzard! CVS - braving the blizzard! I was downright giddy to be at CVS at 11:30 on Saturday night...IN THE MIDDLE OF A SNOW STORM. Gotta love that I'm close enough to CVS that I could walk there! 2 - CVS keychain Chapsticks ($.99 ea) - fillers, I was -$1.67!!! I used a $3/$15 (Almost had a meltdown when it screwed my transaction up... cashier thankfully scanned my CVS card again) and $87.93 in ECBs. OOP = $.26 on a gift card!!!! Received $90.26 in ECBs and will hopefully get another $11.98 for my Sally Hansen! :) = $102.24 ECBs! I kid you not, the cashier actually asked me if she could "count my ECBs" - so the other cashier got out her phone and the two of them went through my receipt!!! Hahahahaha. I wish I could have taken a picture! The fun we have at 12:30 A.M on a Saturday night/Sunday morning! My total got a little messed up on this one... 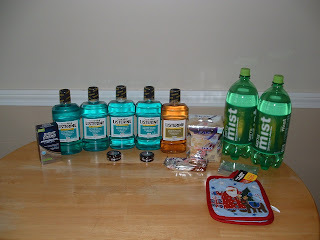 I originally bought the orange Listerines (which didn't count for the deal and were not on sale) - I ended up with $42.11 in ECBs! I bought one of the orange listerines too. That's in my "to be returned" pile. && I'm super jealous you found the thermacare wraps!! Isn't it way better to get cashiers that are excited with you?! I hate it when they are grumpy and kill the "Deal High." 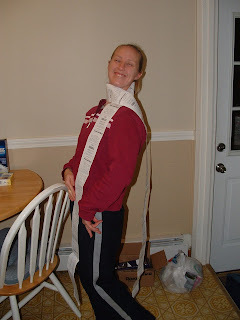 I also enjoyed the ECB scarf. Too funny! Thank you for your blog. I really enjoy it. That's hilarious. I haven't been giddy about CVS in awhile. I got a $25 gift card for get a new Rx there last week. I might just have to see if any stores have anything left in stock.